Long before you go on the hunt for the best scope for 223 rifles, it all begins with a familiar story that goes like this: You pick up your first firearm. You’re probably out hunting with your family or some buddies. Then, before you know it, it’s not something you do for fun anymore, but something you’re passionate about. Yeah, we’ve all been there. Before you know it, you’ve traded in your beginner rifle for a more advanced firearm like the AR-15 and with your .223 rems all loaded up you’re ready to shoot with the big kids. 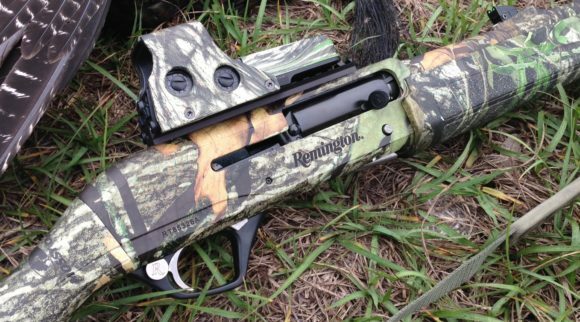 The .223 Remington is an extremely versatile cartridge. From hunting to competitions to shooting with your buddies, there’s not much this round can’t take on. I think we can all agree that the .223 rem is a great rifle cartridge. But to make an already flexible cartridge even more useful, you’ve got to pair it with the right scope. 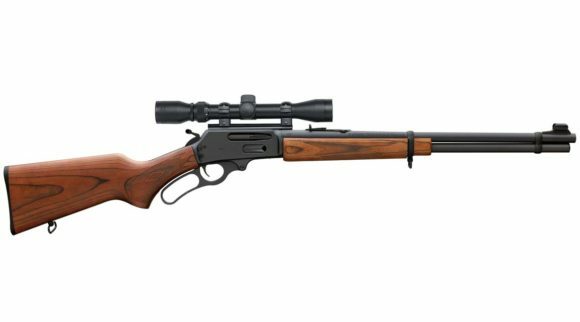 Choosing the best scope for .233 can be quite the task. In fact, going through the process of making that decision can make a person want to bang their head against a wall. Lucky for you we’ve narrowed it down. We’re going to talk about a few of our top picks for a scope with this round and we’ll let you know what you need to consider before making your purchase. 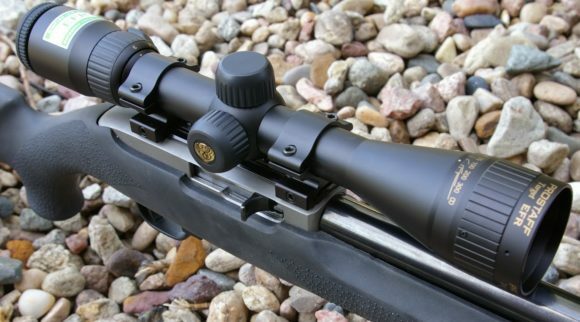 How does a scope work and why do you need the best scope for 223? Before we jump into things it’s important to know what a scope is all about in the first place and why purchasing a good one might be a good idea. First thing’s first, a scope, also called an optic or a telescopic sight, is a device a shooter attaches to their firearm so they can see further distances while using a crosshair in order to improve aim, precision, and dependability. How a scope works is a little more complicated than why you might want one. A scope is made up of five main parts: the objective lens, the tube, the eyepiece and ocular lens, and the turrets. The scope will start out with the eyepiece which is what holds the ocular lens in place. Next is the power ring which you can use to adjust the magnification of the scope. You also have a scope tube which is the long metal piece that connects the eyepiece and ocular lens. On top of the tube is the turrets. These pieces are used to adjust the windage and elevation in MOA or MIL. There may also be a parallax error adjustment in this area. Not all rifle scopes have this feature since this is only needed for long range shooting. After this is the wider area called the objective bell. This is the part of the scope that holds the objective lens in place. As you may have guessed, the next part is the objective lens. As mentioned there are lots of parts that go into a scope but the most important part you will find are the lenses. The largest lens is the objective lens which is what transmits light to the ocular lens, the lens that the shooter faces. This lens is usually made to be fog proof and water proof for obvious reasons. You need a scope on your firearm for the simple reason of life being so much simpler when you have one. No one is able to have perfect aim and precision with just their naked eye and a firearm as much as we would like to believe we could. If you are doing any type of long range shooting a riflescope is one hundred percent necessary. A scope is also great for a lot of short-range shooting as well but with long-range shooting there is just no question. Without a scope you can expect your shots to be sloppy, unreliable, and unpredictable, while a shot with a scope becomes laser-focused, repeatable, and dependable. Whether you’re shooting for fun, hunting, or in a competition getting the best scope for 223 rifles is always a good idea. Before deciding which scope is best for .223 you must consider some information to make an informed decision. There are a lot of components that go into buying a scope and if you aren’t sure about what the terms mean and how they affect the quality of the scope this can be a confusing process. Let’s break down the specifications you might see on each of the scopes and why they matter. Your reticle is the little crosshairs you see inside your lens when you go to use your scope. There are lot of types of reticles out there and which one you use is up to personal preference. Three popular reticle types are mildot and BDC. BDC reticle: A BDC or bullet drop compensating reticle is a modified crosshair that uses markings under the middle of the crosshair to predict bullet drop over long range. Mildot reticle: The name mildot comes from the term MIL or milradian. A mildot reticle uses milradian dots on the crosshair for measurement and allows the shooter to find the approximate distance of their target. Illuminated reticle: An illuminated reticle uses light to brighten the reticle in order to be able to see in low lighting conditions. Dot reticle: This type of reticle simply uses a red dot in the middle of the reticle to aid in aiming. MOA (stand for minute of angle) and MIL (stands for milradian) are types of measurements used when adjusting your scope’s turret. This is also a personal preference. While most scopes used to use MOA trends are now pointing towards MIL. The ease of use in your optic will be something that will drastically improve your user experience. There is a lot of technology out there these days that will help your rifle scope be easier to use and can help you save time and effort. A few features that aid in this may be a fast focus eyepiece, zero-reset turrets, and illuminating reticles. The glass used for your optic is going to be what makes or breaks the image you receive when looking through your scope. High quality glass will enhance the image’s sharpness, color, and contrast. It will also likely be multi-coated allowing for more light as well as fog-proof so that you are able to utilize it in any condition. Your tube size is going to affect how wide your field of view is. If you size up in the tube size, you will also get a wider field of view. This can also affect how heavy your optic turns out because your tube is one of the main factors that contributes to its weight. Some people believe that a bigger tube size will contribute to the scope transmitting more light but that is actually not the case. The size of your tube does not usually make a huge difference in the overall quality of your optic, so it is not something you should put much weight on. Eye relief is the space between the shooters eye and the scope in which they can still fully see and utilize the picture. The farther away that a shooter can be from the scope while still being able to see everything clearly, the better. This helps with where you can mount a scope to your firearm, how comfortably you’ll be able to hold it, and the safety of your scope. Eye relief helps with safety because you want to have your face as far away from your firearm as possible so that you don’t get hit due to recoil. Your objective lens size dictates how much light you’re able to bring in, in this case typically bigger is better. But as expected, bigger also normally means more expensive and a bigger lens size means that your scope may end up being on the heavier side which is not ideal. 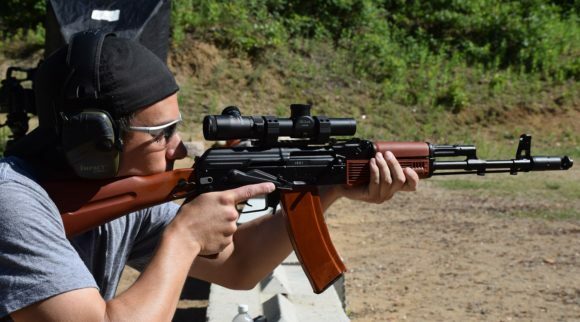 The brand of an optic may be something you want to heavily consider. Like any other products on the market, there will be optics by brands that are more reputable than others. Certain brands have been around for a long time and have a history of producing high quality optics. Another thing to consider is the warranty and customer service that the brand provides so that you know you are in good hands should anything ever go wrong with your scope. While price may be a determining factor when making most scope purchases, the majority of scopes made for .223 rounds are fairly inexpensive. Still, depending on your circumstances price may be a deciding factor for you. If you are a more experienced shooter you may find that a more expensive and complex optic may be up your alley. Likewise, if you are just starting out you may not want to make such a large investment upfront. The weight of your scope may matter to you if you believe that you will be carrying your firearm around for long periods of time. If you think that you only will be using your firearm every now and again and for short time periods, this may not be important to you. Depending on how you plan on using your firearm, purchasing a scope that performs well in low lighting conditions may be in your best interest. Usually if you are hunting during evening hours you will need a scope with an illuminated reticle option so that you can still clearly see through your scope and use your crosshairs as intended. Accuracy is likely going to be the most important factor to consider when buying a scope for your AR-15. A scope is nothing if not accurate as the whole reason you are purchasing a scope to begin with is to improve long range precision and dependability. When choosing the best scope for .223 you’re going to want to try to find the optic with the most accuracy possible that way you can take the guess work out of shooting and improve your performance. The ruggedness of a scope is similar to its durability. This has to do with whether or not it is weather proof, fog-proof, or shock proof, and another factor of this is the material it is built out of. A shooter would want his or her scope to be as rugged as possible so that they get their money’s worth out of their scope. The more rugged an optic is, the longer it is likely to last. The clarity levels of a riflescope are incredibly important because this affects how well you will be able to use the scope overall. If the scope is not clear, the reticle becomes useless and none of the other features of your scope matter. 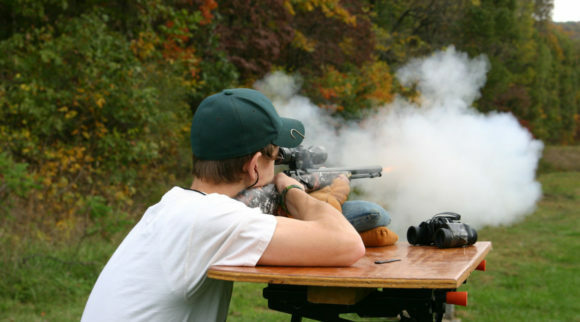 Without clarity a scope is not very useful at all and the addition to your firearm will not improve your performance. The magnification capabilities of your scope matter especially when shooting in long-range scenarios. How well a scope can zoom and magnify on a desired target will determine how much accuracy a shooter will have at far distances. When the magnification capabilities are higher, the shooter will be able to shoot farther with more repeatable and dependable precision. Whether your reticle is in first or second focal plane is again, personal preference but something you may need to consider. When your reticle is in first focal plane (FFP) you will notice that your reticle will change sizes as you zoom in order to keep up with the magnification. On the other hand, a reticle in the second focal plane (SFP) will remain a constant size regardless of how magnified the view is. Nikons are a tried and true company when it comes to firearm scopes. And given that this Nikon was designed specifically with the .223 rem round in mind (hence the name), it’s no surprise that this is one of the most popular scopes on the list for this type of round. While this option is budget friendly, the quality of the scope is not lost. The P-223 is well-made and extremely rugged for the price with waterproof and fog proof features making this scope a great choice for any weather condition. The scope’s large objective lens at 40mm uses its fully multicoated lens system to help transmit more light for a brighter image allowing the picture given through this eyepiece to come across clear as day. 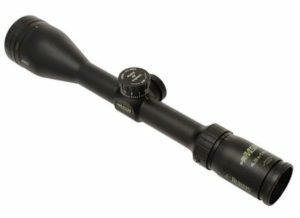 Another great feature on this best scope for 223 is the generous eye relief at 3.6 inches. Additionally, the scope offers a bullet drop compensation that is simple to use and helps to improve the shooter’s accuracy. Bullet drop compensation works by using a reticle that predicts how much the round will drop at a given range. The BDC reticle uses ¼ MOA adjustments and can go farther than 600 yards while maintaining precision. 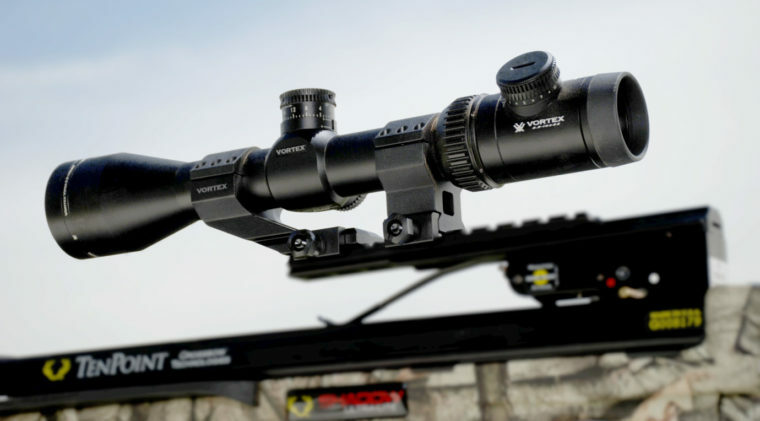 Scopes by Vortex are sure to be high quality and well-made while having a great warranty. 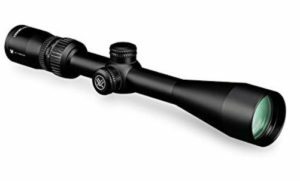 This durable scope is an excellent choice for any shooter whether they are a hunter, hobbyist, or they plan to use the scope in competitive scenarios. Its aircraft grade aluminum build and argon gas purging technology help to make sure this optic can be used in any harsh weather conditions, making it completely weatherproof. 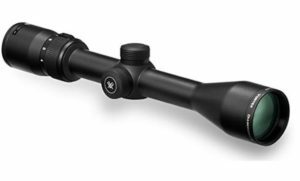 There are many things that make this a best scope for 223 and its premium lens components are at the top of the list. The lens uses fully multi-coated optics to allow more light in while keeping a crisp and clear image. This paired with a fast focus eyepiece aids in its user’s speed and precision, helping for quicker and more flawless shots. The Diamondback’s ability to hold zero at all times is another feature that makes this one of the most reliable scopes on our list. This scope is also a great option for those looking to shoot with extreme long-range precision as the magnification on this optic goes all the way to 12x. 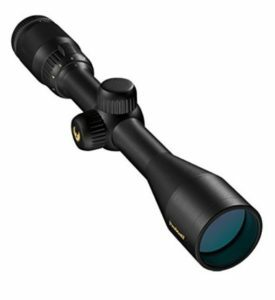 The Copperhead 4-12×44 boasts a massive amount of eye relief and extremely high magnification capabilities. With the help of its fast focus eyepiece, this optic is ideal for any hunter on the go that is interested in ease and a quick shot. Its multi-coated lens in the second focal plane and larger than average objective lens size helps to receive a brighter and sharper picture. The device also uses ¼ MOA adjustments helping the user to get as precise as possible while the turrets on this scope allow for a simple return to zero after shooting long distance. As for the magnification goes, the zoom on the Vortex Diamondback is clear at every level without catching on the way. This optic by vortex is also highly durable thanks to its aircraft-grade aluminum construction as well as its waterproof and fog proof design. 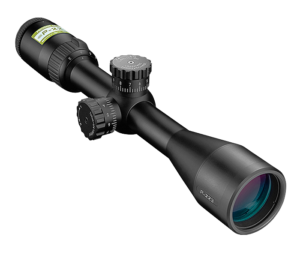 While being a more affordable option, this scope is a great value for the money and is incredibly feature packed. The Nikon ProStaff’s zero-reset turrets make field adjustments simple and quick with its spring-loaded adjustment knob. The multi-coated optical system which is usually only found on more expensive optics, allows for up to 98% of light transmission. This helps make for a brighter and clearer image. 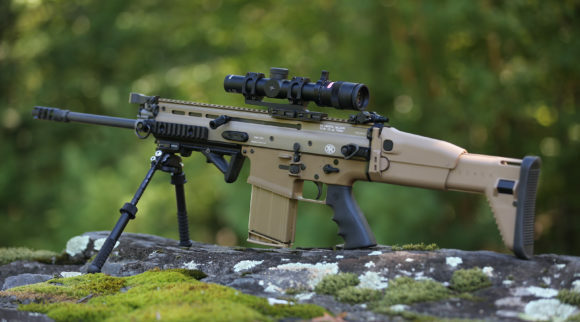 Like the Nikon p223, this optic also has the BDC reticle technology. The BDC makes long range shooting a breeze but does not have an illuminating option for those seeking to use this after nightfall. 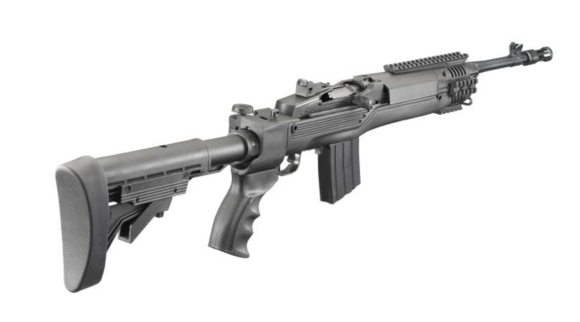 This optic has the shortest magnification capabilities, so it may not be suited for the longest-range shots. It is also worth noting that the ProStaff 3-9 x 40 is also waterproof, fog proof, and shockproof making it extremely durable and long lasting for the price. 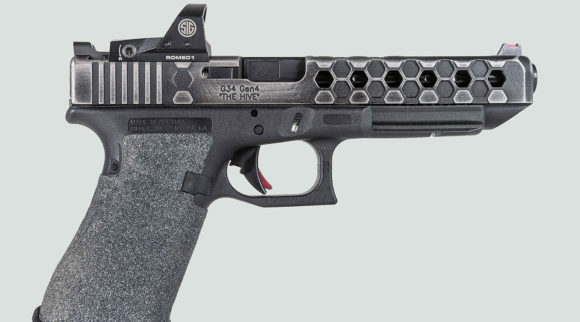 But not to worry, although this has a rugged build this is still going to be one of the least heavy options of the bunch given that it is made of lightweight aluminum. 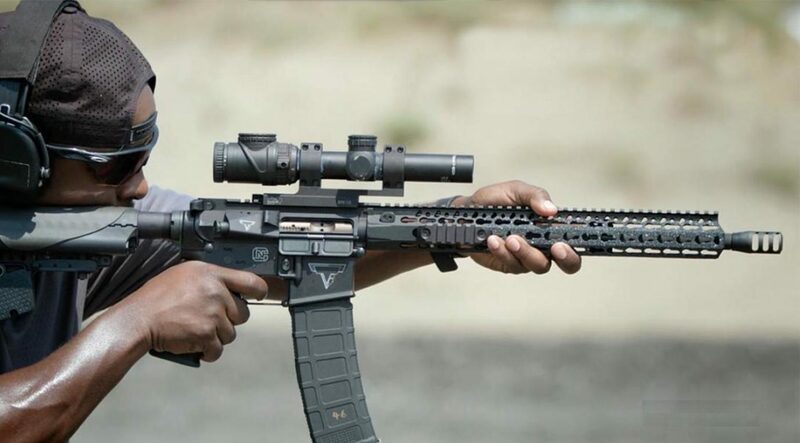 The Burris brand is a respectable brand in the rifle scope community and comes with the Burris Forever Warranty as well as great customer service. 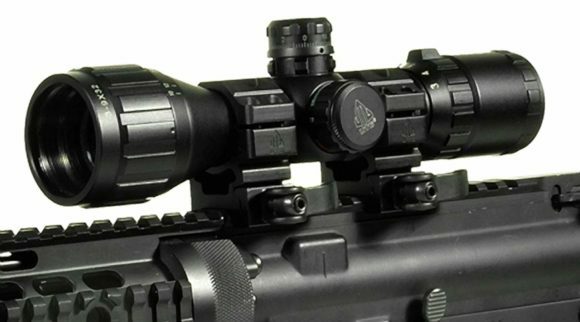 The Burris MSR scope is a budget friendly option that does not skimp on quality. It comes with an easy to use reticle which was made specifically for .223 and .22 LR rounds with long-range shooting in mind. The scope also provides a great amount of eye relief and is built to withstand a heavy amount of shock as well as recoil. Like most Burris riflescopes, the MSR line produces tough and reliable scopes while being sure to not add too much to its size and weight. Users will find that the image on this optic is clear and crisp, using a multi-coated, anti-glare lens. Speaking of the lens, since it is made with high-grade optical glass you can also expect improved brightness and long-lasting durability. Also, worth noting is that this scope is going to be the best for long range precision since it has the largest range for magnification of all of these options. Unfortunately, a downside of this scope is that it does not have illumination capabilities, so this may not be the best option if you plan on using your rifle at dawn on a consistent basis. Something to think about when buying a new scope is how much experience you have with scopes and firearms. If you’re new to using scopes you may want a simple scope at a lower cost. On the other hand, you may also want something with more customizable options if you are a more experienced shooter. One more thing to consider about your scope is how you plan to mount it to your firearm. Mounting your scope to your firearm properly will allow you to use the combo in a safe way while being assured your scope stays in place and does not get damaged. There are a few options you have when mounting your optic to your firearm. 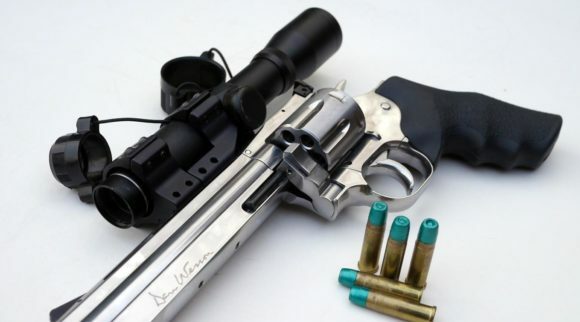 Before you can choose which way to go you must know whether you plan to mount your scope to one single firearm or not. 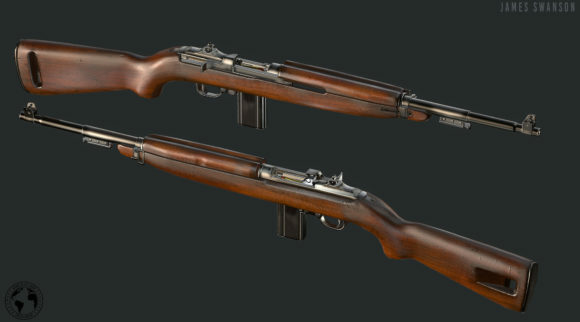 What is the best scope for me? When it comes to long range shooting you really can’t go wrong with using .223 rem. which is why adding the perfect scope to the duo will make your shooting experience even better. You may be thinking that these all sound like great options, but you aren’t sure which one to pick. While any of the five choices on this list will certainly be a good match, there are many factors that will vary from person to person. If you are looking to shoot at extremely far distances you may hold the magnification capabilities high in your decision. On the other hand, if you know you’ll need to use your rifle the most during darker hours of the day, a scope’s illuminated reticle option might be more important to you. In order to get the best scope for your own needs you must consider which characteristics are the most important to you, study up on the brands that you are considering, research using online reviews like this one, and take the time to read through some real customer reviews. At the end of the day, the best scope for your 223 is going to be what you are most comfortable using and the one that makes you most excited to get out there and enjoy your firearm.